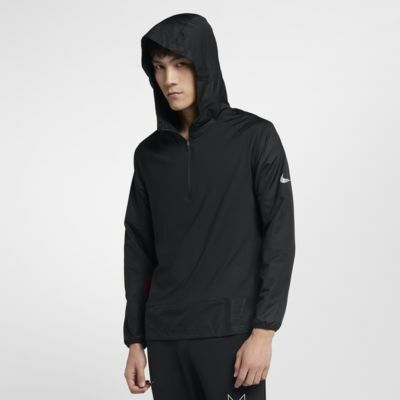 The Nike Men's 1/2-Zip Running Hoodie offers customisable coverage. A mix of jersey and woven fabric helps keep you dry. An adjustable hem lets you cinch it up to help block out the elements or let it loose when the weather clears. The Nike Men&apos;s 1/2-Zip Running Hoodie offers customisable coverage. A mix of jersey and woven fabric helps keep you dry. An adjustable hem lets you cinch it up to help block out the elements or let it loose when the weather clears. Runner-specific hood won&apos;t limit visibility while running. Adjustable bungee on the hem lets you customise your fit. 1/2-zip design offers easy on and off and customisable coverage. Drop-in pocket on the front-right of the hip has an internal loop to secure a key. An "AIRMAX" graphic stands out on the back. Fabric: Body: 88% polyester/12% elastane. Panels: 100% polyester.